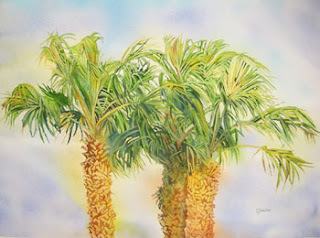 "Three Palms" is another new piece that I just finished last week. It is 23 x 30 inches and is painted wet in wet with layers of masking to create the details. I am exploring some new thing in my paintings and I like the direction things are going so far. I still have some kinks to work out in my methods before I share the techniques. I will be in Vero Beach, Florida this Saturday for the Hibiscus Festival in the park downtown. Please stop by and see me if you are in the area. You will be able to see my new pieces up-close and personal.